The Sweetest Flowers On Earth! A chocolate candy bouquet, whether homemade or purchased from a high end boutique, makes a perfect gift for any occasion! Think about it! Who wouldn't be delighted to receive a colorful arrangement of their favorite sweet treats? I've been on the receiving end of candy bouquets and I was absolutely thrilled each time. :) Just thinking about it makes me smile. I'm going to give you some step-by-step instructions on how to make a chocolate candy bouquet. It may surprise you at how very easy it can be. Sure, it can be a little more complicated if you decide to make your own molded chocolate flowers, but there are OPTIONS! You can make a beautiful bouquet using store bought candies and it will still be pretty impressive. But maybe you're on a tight budget and you want to save a little money and add your own personal touch. That can be done, too, without too much trouble. Let me tell you about one of the clever gifts I received from a friend. Last year I received a wonderful present in the form of a Reese's cup chocolate candy bouquet. I absolutely loved it! A clever friend of mine created it with her own hands which made it all the more special to me. Jennifer discovered that I was partial to Reese’s cups and designed a chocolate bouquet that I enjoyed, with a little self discipline, for several weeks. She started with a lightweight tin base. This particular one was painted with flowers and quite cute. You can use practically anything as a base that will fit the size bouquet that you are interested in making. Secondly, she placed a piece of foam inside the base. You can use the kind that is normally used in flower arranging. This is relatively inexpensive. I hang on to any that I receive with flowers and store it for future use. Next she arranged a selection of silk flowers in the foam as you would for a regular arrangement. She chose flowers with fairly well open petals. 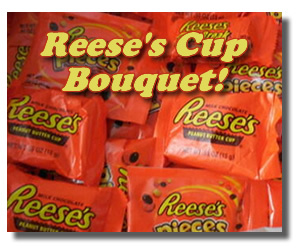 After that, Jen bought individually wrapped single Reese’s cups and hot glued one to the center of each flower. You could do this with any type of wrapped chocolate candy as long as it wasn’t too large or heavy for the stem. Another clever idea is to make a Chocolate Candy Bouquet Gift Basket by using individually wrapped bite sized chocolates or bon bons. Here are the items you will need to get started. Tissue paper, cut into 8”-10” squares, equal to the number of chocolate “flowers” and a few extra for filler. Chocolates – must be room temperature. Most of the supplies you need can be purchased online if you like. 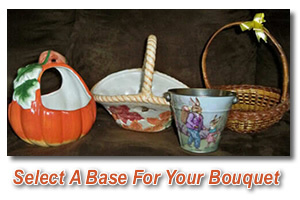 You will find baskets on eBay as well as other containers, and foam. I love finding bargains there. and other candy making supplies. For a selection of chocolates you can just go to your local grocery store or Walmart. If you prefer to get them online I would suggest either A Candy Store or Candy Crate as they both have a huge selection and also make it easy to buy in bulk if desired. Start by preparing your base. Whether you choose a basket, box, tin, or planter, be sure it is clean and ready to go. Place a piece of florists foam in your base. It looks best if it is not protruding over the top of your base. Push each skewer through the center of a piece of tissue paper. Twist it lightly where it meets the skewer forming a flower like appearance. Secure it with a piece of clear tape about half way or so down the skewer. You may want to test it in a few different positions to decide on the look you want. Gently push a piece of chocolate onto the tip of the skewer. Don’t forget. If the chocolate is cold it will crack. Be sure they are at room temperature. Finally, arrange your "chocolate flowers" in the foam at varying depths and angles to form your lovely chocolate candy bouquet. You may need to tuck in a few extra pieces of tissue paper here and there to round out the look and cover the foam insert. I love to go to garage sales. I keep my eyes open for odd little items that I can recycle into gift ideas. I often find baskets, ceramic bowls/pots, and tins for under $1. You can also pick up silk flowers and other things that may trigger an idea in your mind. As an alternative, you can use a small box as your base and cover it with wrapping paper or tissue paper that matches the theme of the gift (birthday, Christmas, anniversary, etc.). Let your imagination run wild. You can use chocolate kisses, Ferrero Rocher, mini chocolate bars, mini Reese cups, or any other variety of small wrapped chocolates. Alternately, you can use ready made lollipops as you flowers and just add the tissue paper. As always, I invite you to share your ideas with me and my guests using the form below. Feel free to share your bloopers,too! We can all do with a good laugh at ourselves from time to time. Honestly, though, how can anything to do with a chocolate candy bouquet be a blooper? 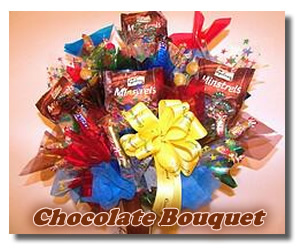 Chocolate candy bouquet baskets are a lovely gift for any occasion. Unless someone is allergic to chocolate, you can’t go wrong! I hope that you will enjoy making them and receiving them as much as I do. Given Or Received A Spectacular Chocolate Gift? What is the best chocolate gift candy you ever received? Tell us all about it. We'd even love to hear the details, like who was the wonderful person who treated you to the delectable treat? Maybe you've got another great idea for making your own chocolate candy gift. Do tell... We always need more clever and creative concoctions!